If you’re anything like me (and I know you are), you have squirreled away keepsakes for someday, when you finally find time and/or brilliant ideas. In reality, most of that stuff will stay in boxes until we die and leave it to the next generation to look over and wonder what to do with something that was obviously important enough to save. Anyhow, I finally got around to doing something with at least part of the keepsakes I saved from the months Toby, Eleanor and Callista spent in NICU. They were born the week of Thanksgiving, so we were still there for Christmas. They wore their first hats (tiny little things that are even too small for most baby dolls) for weeks until a kind Twitter follower mailed us three Christmas hats she had made for ETC. I had hoped to put these hats plus their first pacifiers and hospital bracelets in three acrylic ornaments that come apart for easy filling, but last minute shopping left me with traditional glass ornaments that limited what I could fit through the small opening – a hat and the Baby 1/2/3 bracelet that matches each hat. Maybe someday (ha! SEE?) 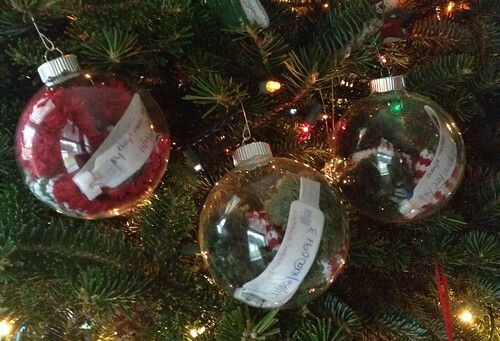 I’ll do what I really want, but for now, I’m so excited to have such a special set of ornaments to add to our tree. Christmas in the NICU (or any hospital stay, for that matter), is far from ideal, but we made the most of it. Despite all the sadness, stress and chaos of ETC’s first Christmas, it was still our first, and it will always be special. This is such a great idea! It’s amazing how far they’ve come! I cry every time you post flashback photos. Your kids are so beautiful.